Regardless of which version of history you believe and what holiday(s) you do or do not celebrate, I think it’s worthwhile to have a “winding down” of the year during which we shift focus from frenzied work and socialization to calm time with family and friends–and with ourselves in quiet reflection. For me, it goes kind of like this: work extra hard for weeks getting ready to be (mostly) out of the office; run like mad for a couple of days to get ready to go visit family; spend a day traveling; relax, unwind, and enjoy being with people I love for a day and a half; discover when I relax that I am exhausted and require frequent naps; spend a day traveling back home; collapse and relax (relatively) quietly until New Year’s Eve, reflecting on the past year and working on some sort of self-discovery that I optimistically believe will lead to life-improvement. The time with family and the week “off” between Christmas and New Year’s Eve are the times that matter most to me. I’ve given up on massive consumerism in favor of minimizing the gifts and enjoying the visit. For gifts, I go with silly stocking stuffers and money for my college-aged nephews. Tisen is the only one I go overboard on. I bought him a fleece that fits him like a dress, a bigger Lamb Chop, and some treats. He’s easy to buy for and he thinks every gift is perfect. Oddly, now that Christmas is so much easier (stocking stuffers for 4 and money for 2; I don’t even do cards anymore), it’s less enjoyable. Having removed the majority of the consumerism from the holiday seems to have also removed much of the potential thrill. Gone is the feeling of connectedness and belonging that comes along with knowing someone else so well or at least having paid close enough attention that you came up with that perfect gift for them. On the flip side, after years of failing to think of the perfect gift for the people I love, I go in with realistic expectations and come out without disappointment. Perhaps the secret is not tying the spiritual calming of year end reflection and time with loved ones to gift giving. Perhaps we could give gifts when the perfect idea presents itself instead of based on a date on the calendar. Then the only problem is if the perfect idea never comes. Note: my husband is once again the guest photographer for all photos of the Raptor Experience, including in yesterday’s post. One of the great pleasures in life is sharing something you love with someone who enjoys the experience. Think about it. While on the one hand, we might respect that everyone has different tastes, there is something in human nature that causes us to gravitate towards people who appreciate the same things we appreciate. And introducing someone to something that’s a personal favorite makes for a particularly enjoyable experience. It’s like discovering a new food that makes you want to groan when you put it in your mouth and finding out that someone else has the exact same reaction–it’s something in common, creating a tiny bond. I think that’s why I enjoy volunteering for Wings to Soar so much. 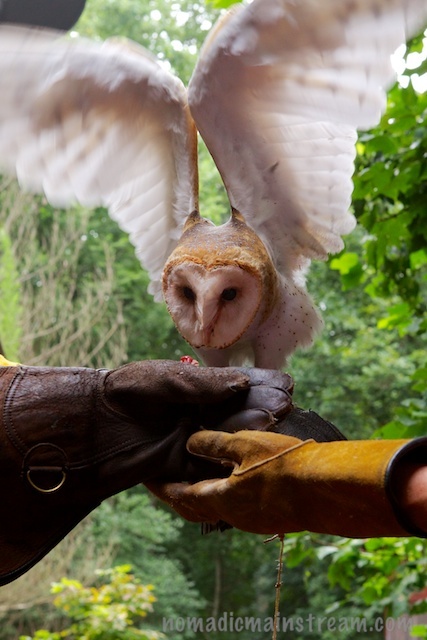 There aren’t many people who don’t enjoy getting up close to birds of prey. There are a few. 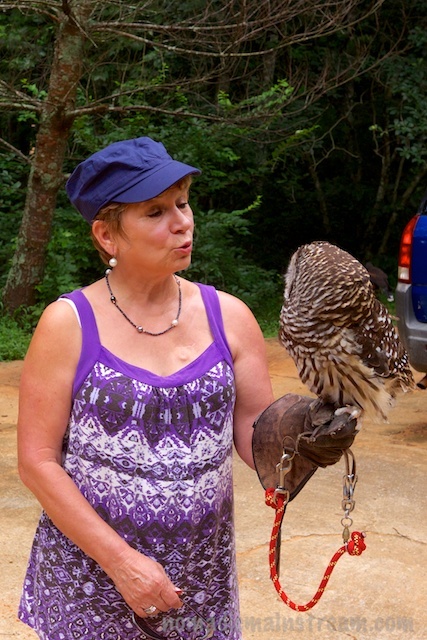 I recently met someone who is terrified of birds–probably not a great idea to introduce her to the raptors. 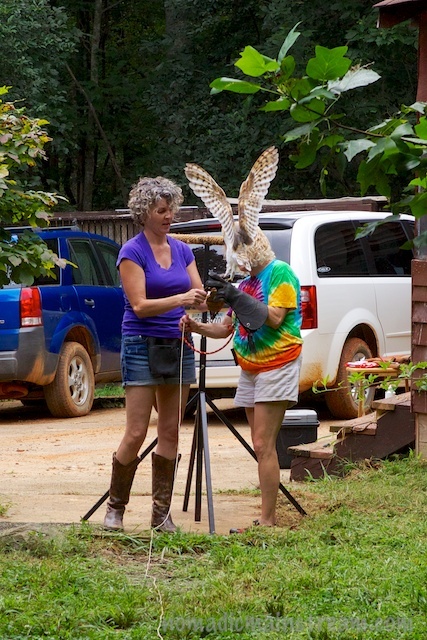 But most people are pretty fascinated by getting to see a creature up close that they normally only get to see soaring overhead or perched high above. It’s interesting how this interest crosses cultures and language. I may not be bilingual, but I’m pretty sure the owls are. They seem to recognize their admirers in any language. 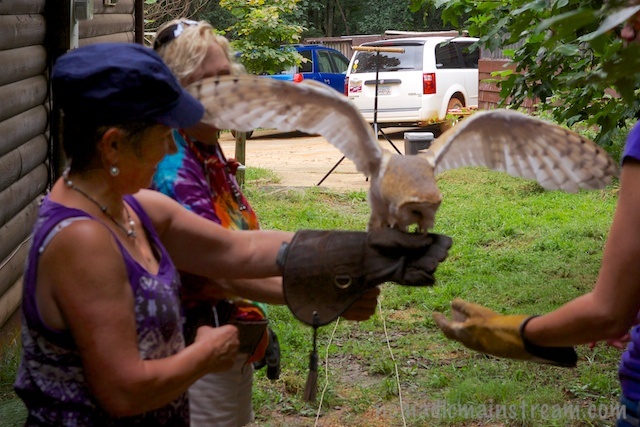 Artie, the Barred Owl, hopped on Horst and Elvi’s gloves and immediately settled down and looked content. 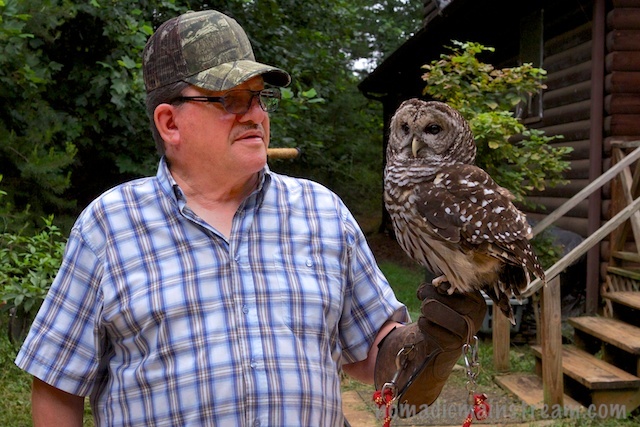 he wasn’t the least concerned about what language they spoke–as far as he was concerned, they spoke owl. 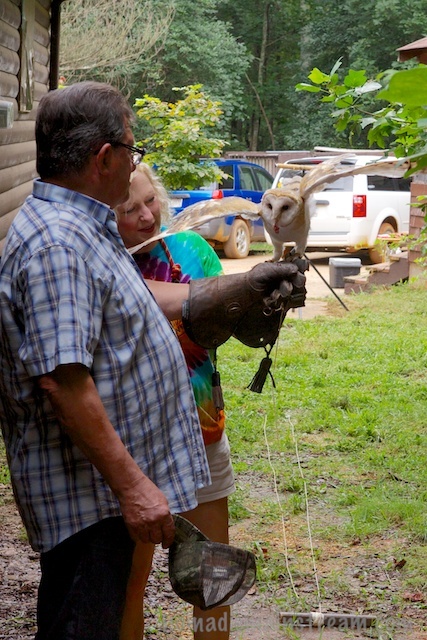 Theo, the Barn Owl, however, might have been a little too settled–he was content to ride over to Elvi and Horst when we were hoping he would fly. He sat on the perch and stared, occasionally acting like he was going to fly, but then waited patiently for Dale to come over and put him on her glove. Dale walked Theo closer to Elvi and Horst in turn, trying to get Theo to a distance from which he would fly. Theo looked longingly at the tasty piece of mouse on the destination glove, but he wouldn’t fly to it. When Dale put her glove next to Horst or Elvi’s glove, he happily hopped over to their glove and munched contentedly. He seemed perfectly happy; he just didn’t feel like flying. Theo is a human imprint–he was raised by humans and doesn’t really understand he’s an owl. I sometimes wonder if his reluctance to fly is because he identifies so much with humans, he starts to think it’s unnecessary. But, then there are days when Theo doesn’t seem to want to sit on a glove at all. He baits and baits and can’t seem to stay still. I don’t know if it was the calming influence of Horst and Elvi, but I think he would have sat all day.